Windows allows users to manage IEEE802.11 networks from Command Prompt. It is done by creating wireless filters to prevent that computer from connecting to the specific WiFi network. Settings wireless filter is very important in case if you suspect your PC may join a suspicious wireless network and risk the security. One of the major threat of a computer with WiFi facility is to get connected to suspicious Ad-hoc networks. A hacker runs an ad-hoc network can steal data from your computer if it is connected it and the risk is higher if file and printer sharing is enabled. A properly set WLAN filter can protect your laptop from all the above risks. This tutorial explains how to create, manage and remove WLAN filter on Windows 8, Windows 7, Vista and XP computers. This section explains Command Prompt method to set wireless filer for a WiFi network on Windows PC. It also explains how to delete the WLAN filter in case if you no longer want to block that particular network on your computer. We can block both infrastructure and Ad-hoc networks by creating filters. I have explained this part with practical examples. You can set wireless filters for both ad-hoc and infrastructure 802.11 networks. The format of the code to create a wireless filter to block a network is provided below. Now let us consider a practical example. Here I am going to create a filter for WiFi network "Siju1". It is an ad-hoc network and the command to enable the filter to block it is given below. You must start Command Prompt as administrator to perform it. Right click on cmd on Window search and select run as administrator. Before running this command, make sure WLAN AutoConfig service is started. If you haven't completed the above two tasks, you may get an error like this. Now we must do the following tasks. To enable the wireless filter, command prompt must run as administrator. Follow the steps to run your command prompt as administrator. To do this follow the steps provided in the link below. If you have completed these two steps before running the command on DOS prompt, you will get a message like this. You will see the message the filter is added on the system successfully. If any wireless filter is set on your computer ago, it will stop you from accessing the specific network. So, in order to verify there are no unauthorized or unwanted wireless filters are turned on, you must periodically check all WLAN filters set on your Windows computer. You can display all available wireless filters by typing following command on Command Prompt. If any wireless filters set on your computer to prevent from connecting to a specific connection, you can remove them from DOS prompt itself. The syntax for the command to delete filter is given below. Now let us check the procedure to check and remove unwanted filters. 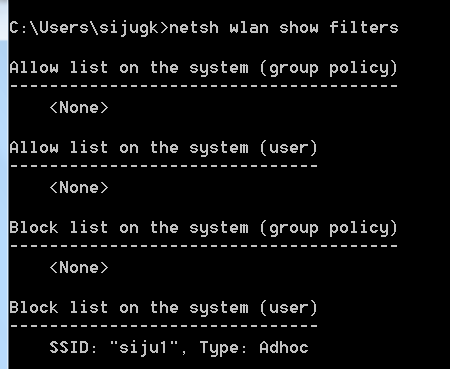 View available filters by running the command netsh wlan show filters on DOS Prompt. Here I need to delete siju1 filter. Type the command below to delete the specific filter. Make sure DOS prompt is running as administrator.